What to look for when buying a bike water bottle? Any athlete will tell you that staying hydrated is a very important part of exercising and obviously this applies to cyclists as well. Sweating decreases hydration. It is therefore important that you have a water bottle with you at all times when you cycle so that hydration levels can be kept at their optimum. To help with this, we have created our top 5 water bottles for cycling for you to take a look at. 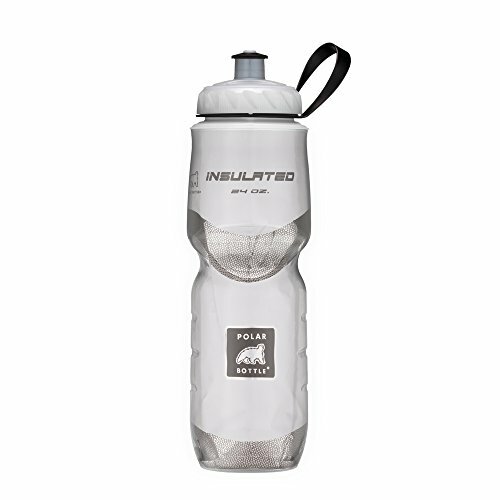 If you require an insulated water bottle for your bike, then you ought to consider this Polar bottle, the original makers of the insulated BPA-free plastic sports bottle. It’s a leak-proof bottle, able to securely store liquid keeping it cool for twice as long as many comparable bottles. It is able to do this due to its thermal protection, double wall construction, and thermal air barrier. If you cycle outdoors, the foil layers within this bottle reflect the sun’s rays so that it does not heat your drink. This bottle is lightweight, dishwasher safe, freezer safe and impressively durable. It comes with a carry strap to make drinking on the go much easier. At 24oz, this is the most popular size of the Polar bottle range. Accommodating ice cubes through its wide mouth and it’s very easy to clean. A popular option for people looking for a greener way to stay hydrated and reducing the number of plastic bottles they purchase when on the go. Why We liked It – We like the Polar Bottle Insulated Water Bottle – 24oz because it holds a great amount of liquid which can be kept cool for long periods of time even when in direct sunlight. Looking for a bike accessory that stands out so that you can easily distinguish your bottle for everyone else’s? The CamelBak is available in a range of jazzy colors and is capable of holding 24oz of water. It has been cleverly designed so that it’s jet valve cap self-seals enabling you to obtain a quick and powerful amount of water whenever you require it but without spilling any of the bottle’s content down your front. With its secure lock-on cap, this is a leak-free way of carrying water with you wherever you cycle. This is a BPA and BPS free bottle that has squeezable sides. 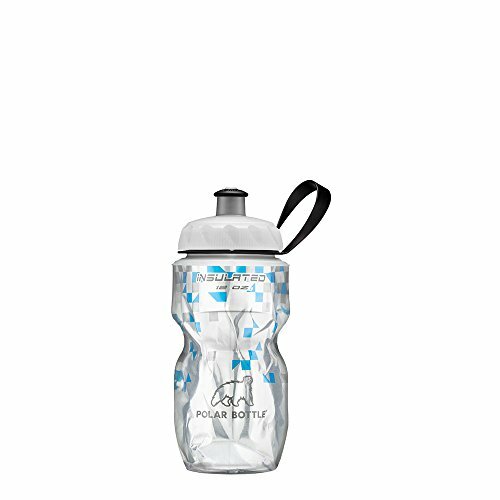 It also has a hydro guard and has been created through the use of Podium, which is ideal if you are fed up of water bottles having that horrible, well-known taste. Even without flavored liquid, you do not need to suffer having nasty tasting water bottles any longer with this cleverly designed, and fun patterned CamelBack bike water bottle. Why We Liked It – We like the CamelBak Podium 24oz Water Bottle because it offers a powerful and fast flow of water with no risk of spillage or fluid wastage when drinking and cycling simultaneously. 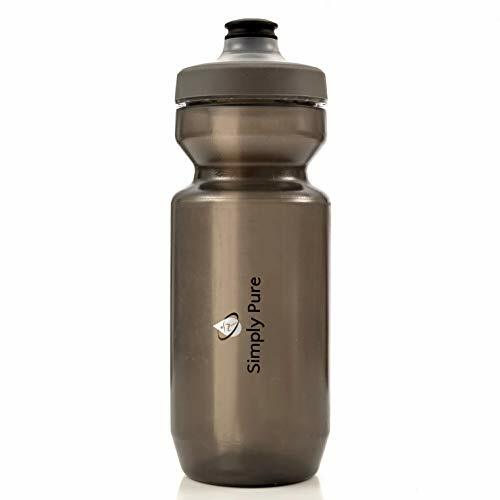 This 9.5 inches tall, stainless steel bike water bottle, brought to you by Simply Pure, has been created so that cyclists no longer have to put up with their water bottles smelling or tasting foul. It is BPA free and has been innovated using FDA food grade materials only. It is lightweight, holds 22oz of liquid and is flexible in its makeup. As this bottle is so easy to grip, it enables you to drink as you ride so that you do not have to cease activity every time you require fluids. With a Watergate cap, hands-free open and close ability, and is 100% leak proof. It has a self-dealing heart valve so that your bottle will not be able to leak even if you accidentally leave your bottle’s valve open. If you are a rather accident prone cyclist and want to avoid any soggy problems, then this is definitely the bike water bottle for you to consider. Why We Liked It – We like the Simply Pure – Purist 22 oz Water Bottle because it cleverly allows you to obtain fluids without having to stop cycling through the use of its hands-free valve. One of the more substantial bottles in its fluid capacity is the CamelBak Podium bike water bottle, holding an impressive 25 oz. This is an insulated bottle constructed with double walls so that your drink can be kept cool and refreshing for hours – something you will really appreciate on a long and challenging ride. With a jet valve that self-seals, you can prevent any drips and leaks while also being able to obtain a powerful flow of water, even as you continue cycling. It has a secure lock on the cap, is leak free and is free from all nasty, stereotypically associated water bottle tastes. As a BPA and BPS free bottle with a Podium chill, this is a great way to transport not only water but also shakes and powdered drinks, too, so that your fluid levels are kept are their optimum rate. 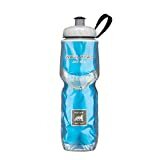 Why We Liked It – We like the CamelBak Podium Big Chill 25oz Insulated Water Bottle because it has such a large capacity ensuring you keep well hydrated at all times during exercising. If space or weight are crucial factors for you to focus on, then this Polar bottle could be a great choice. It is small and compact, allowing it to be used both on a bike and in a rucksack. It has a double wall, so heat is kept out, and cold is kept within your liquid, helping your drink to remain cool and refreshing as you embark on your cycling journey. This BPA free water bottle does not have toxic compounds used within its make up and fits easily, safely and securely within any standard sized bicycle water bottle cage. Its wide mouth enables ice cubes to pass through it easily and enhance the ability to be able to wash the bottle more thoroughly to avoid the nasty taste and smell associated with water bottles. Place this Polar bottle in the dishwasher and the freezer, resting assured that no damage will be done to this small but mighty transportable drinking vessel. Why We Liked It – We like the Polar Bottle Insulated Water Bottle – 12OZ because it is so easy to transport water. It is small, compact and fits securely into a cycling bottle cage or backpack. If you are a cyclist who frequently goes on long-distance bike rides, think about purchasing a larger capacity water bottle to aid your hydration levels. Buying a water bottle that is of too small a capacity could be dangerous as you may rely on a water source that potentially isn’t there. You don’t want to run out of water when you require it the most! The best thing in the world during a long and challenging cycle experience is a long, cool drink. It’s refreshing and helps you to keep focused. On the other hand, there is nothing more off-putting than lukewarm water when you’re sweating from exertion and desperate for some respite. Thinking about these two facts, we know that seeking out a bike water bottle that has been created through the use of double wall technology is very useful, keeping your drink cool and refreshing, even when you have been cycling for hours and when it’s hot. This barrier excludes heat and traps cold internally, maintaining a low temperature for your drink. Always look at the descriptions thoroughly. Is the word Podium mentioned? Podium cleverly enables you to drink without encountering the horrible taste and smell that many of us have experienced when we have been drinking from a water bottle. This means that you will actually be able to taste what’s in your water bottle instead of tasting what seems like stale water. After a long, hard cycle, the last thing you want to do is spend hours washing, cleaning and sorting out all of your kits. We know there are certain things that can’t be avoided, but if you can free up some of your time, then why wouldn’t you? Look for bike water bottles that are dishwasher safe so that you can tick the cleaning of your water bottle off your list with very little effort. This way, any bugs, bacteria, or dirt, are eradicated from your bottle, and it will be properly sterilized from the heat of the dishwasher, making it safe, clean and ready for your next ride. You cycle, train, exercise, take care of yourself, keep fit; your health is important to you. So why would you choose to buy a bike water bottle that has been created through the use of BPA? Always look for bottles that are BPA-free so that you know that there have been no potentially harmful parabens used in its creation and you won’t be ingesting any of these either.